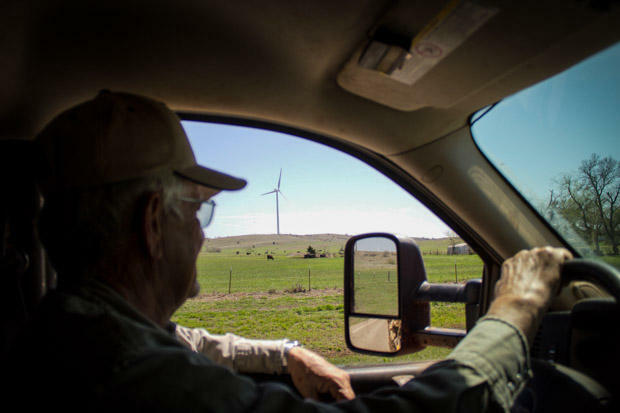 Bob Kerr on his ranch near Carnegie, Okla., which is flanked by turbines from the Blue Canyon Wind Farm. One major tax incentive for wind energy remains on the books in Oklahoma. And the Legislature is poised to end it — more than three years early. The politics of renewable energy have changed as state revenues have failed, but some wind producers say lawmakers are reneging on a deal that sends a bad message to any industry considering investing in Oklahoma. Oklahoma’s wind industry has grown year after year. With 3,400 turbines spread across 41 wind farm projects, the state ranks No. 3 in the nation in the American Wind Energy Association’s report on wind power capacity. As wind farm construction boomed, however, the cost of state incentives written to support the once-fledgling industry ballooned. The industry’s political capital has faded among lawmakers struggling to shore up revenue streams weakened by tax cuts and low oil prices. It has been a rough political year for Oklahoma’s wind industry. Gov. Mary Fallin kicked off the 2017 legislative session with a state budget proposal that called for a brand new tax on wind-generated electricity, an idea supported by influential Oklahoma oil billionaire and Continental Resources CEO Harold Hamm. Weeks later, former Oklahoma governor Frank Keating chimed in, too. In an op-edpublished in the Tulsa World, Keating, a Republican who served from 1995 to 2003, apologized for signing legislation that created the half-cent Zero Emission Tax credit used primarily by the wind industry. “I felt if we could get manufacturing jobs here, the wind blows strongly in Oklahoma. And, you know, farmers and ranchers wanted this, I thought that was a good deal for the state,” Keating told StateImpact. But that deal, Keating says, turned out to be a bad one for Oklahoma. 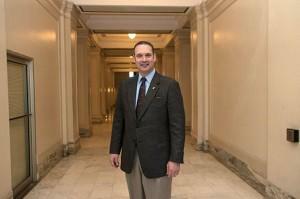 Keating serves as a legal counsel for the Oklahoma Property Rights Association, a group formed by Claremore real estate developer Frank Robson to fight wind farm development. A related wind industry opposition group, Wind Waste, helped Keating write the newspaper column, in which Keating lamented his part in signing off on a measure that evolved into an unaffordable “scam” that created relatively few jobs. Wind turbines line the horizon in southwestern Oklahoma. A state commission charged with evaluating state incentives found the cost of the Zero Emission Tax Credit has soared: From $2.7 million in 2005 to more than $113 million in 2014. With no cap and payments that can continue for up to 10 years, the commission recommended lawmakers limit payouts or limit the amount of time developers are eligible to receive credits under the program. A new tax on wind-generated electricity, as promoted by Fallin, could only be created through a measure approved by a legislative supermajority and appears to have little support in the 2017 Legislature. Republican legislators in both chambers seem most interested in ending the tax credit before its 2021 expiration date. House Bill 2298, which has the support of Republicans and leadership, would move the deadline ahead more than three years — to July 1, 2017. 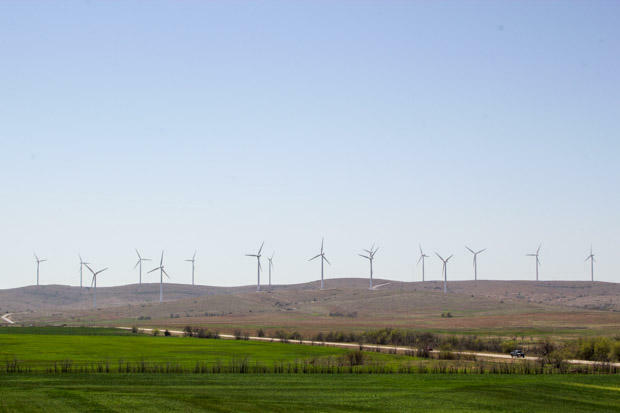 Vanessa Tutos of EDP Renewables, which operates wind farms throughout Oklahoma, says the company has “passed the point of no return” on a the new Redbed Plains wind farm in southwestern Oklahoma’s Grady County. EDP counted on the state tax credit when it started construction on the 48-turbine, 99-megawatt project, but Tudos says there’s no way the wind farm will be up and running by the July 1 deadline lawmakers are considering. House Speaker Charles McCall authored HB 2298, which passed the Senate March 29. The Atoka Republican said the July 1 deadline helps address longer-term state revenue shortfalls, but won’t help fill a 2017 budget gap estimated at $878 million, and was written as a compromise with other wind companies seeking concessions on separate wind-related regulations. Tutos, with EDP, says the wind industry already compromised with Oklahoma lawmakers — two years ago. In 2015, Fallin signed legislation paving the way for tougher wind farm siting regulations and early sunsetting of two other wind incentives. One was a local property tax exemption that was very popular among wind companies. Budget leaders said nixing it likely saved the state $500 million dollars over 10 years. Wind companies went along with the plan because lawmakers promised to preserve the Zero Emission Tax Credit now in the Legislature’s crosshairs. Legislative leaders at the time acknowledged the industry’s willingness to work with lawmakers to reach an agreement. The July 1 deadline could jeopardize millions of dollars invested in land, construction contracts and electrical grid infrastructure supporting the planned Rock Falls wind farm in northern Oklahoma’s Kay and Grant counties, says Virinder Singh, director of regulatory and legislative affairs for EDF Renewable Energy. Singh and Tutos both say moving the proposed deadline back six months — to December 2017 — would mean their companies’ projects can claim the tax credit that was in place when construction contracts were signed. Lawmakers appear uninterested in changing the proposed July 1 deadline, Singh and Tutos say. For years, Oklahoma offered some of the most competitive state-level incentives for wind developers, Tutos says. Even if the state exits the incentive game, she says Oklahoma’s abundant wind will likely remain a magnet for new turbine projects. But, if HB 2298 passes, Tutos says lawmakers are effectively issuing a warning to any industry considering new investment in Oklahoma: Don’t expect the Legislature to hold up its end of any deal.